Offering contemporary style with precision craftsmanship, it makes sense that the Hamilton Collection is a popular choice for bench seating. Combining a traditional slat bench design with modern engineering makes these 4' and 6' park benches great for indoor and outdoor facilities. 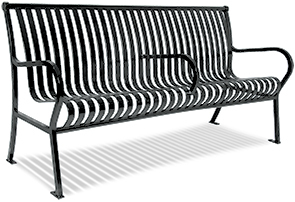 Manufactured entirely with solid steel, these one piece benches feature flowing curved 1/4" thick slats with an elegantly styled frame. From top to bottom, these vertical slat park benches are finished in a smooth, ultra-resilient powder-coating finish that affords protection against environmental conditions to ensure the bench's durability and longevity. Ready to provide for additional seating comfort and convenience the Hamilton Bench Collection can be configured with side armrests, also with or without a center armrest.